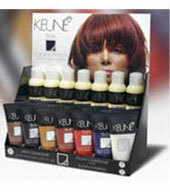 Keune After Color Balsam - LP 300 protects the hair. Silk proteins and the cation active polymers make the hair soft and easy to comb. The balsam locks the color pigments in the hair. The UV filter protects the color from fading caused by sunlight. Silk proteins leave the hair easy to manage. Best used with Keune After Color Shampoo.